This ain't your daddy's fire steel, but it could be your Grandson's someday. Foretrekker's Heavy Duty Fire Steel is unlike any flint you've seen before. The extra long design gives more contact with your striker per stroke, maximizing spark buildup, projection, and heat. You'll notice the difference when you ignite even difficult tinder with ease. The extra thickness means it will last far longer than any other fire steel on the market. With included Fire Cord and striker, you're guaranteed to have a flame, even in wet conditions. This will be the most dependable fire steel you've ever owned. Extra long stroke means a MASSIVE shower of sparks. WIll last for tens of thousands of strikes. Superior to flint in every way. 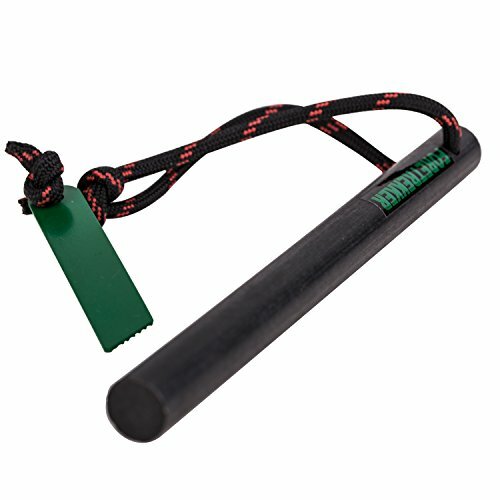 13 inches of cordage with an ignitable center strand for guaranteed fire in any conditions. Striker included. Designed and assembled in USA. This is Foretrekker's most serious fire steel, for serious hiking, camping, bushcrafting, and survival. If you have any questions about this product by Foretrekker Outdoors, contact us by completing and submitting the form below. If you are looking for a specif part number, please include it with your message.